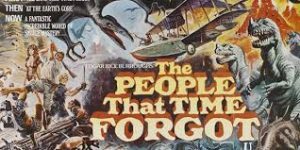 The Land That Time Forgot was a surprisingly decent entry into the lost world of cavemen / dinosaurs adventure genre of the 70s, but this paint- by-numbers follow-up is nothing special. Block of wood celebrity offspring Patrick Wayne leads a band of rescuers in search of first movie survivor Doug McClure. The resulting chases, fights, narrow escapes etc. are the usual stuff of adventure movies, but the stunt choreography comes off as ordinary and uninspired. Oh-so-British Sarah Douglas is along as one of Wayne’s crew but she has little to do here other than stand around looking uncomfortable. And the Lost Land itself, an important and colorful presence in the first film, is less imaginatively conceived this time around. Not a bad time waster when you have nothing better to do for a couple of hours, but try not to expect too much in the way of visionary fantasy.